So, I underperform, and he overperforms, I don’t pop him and he makes a snake eyes instability test and the combat drags on. His fast movers start making it into my fire base hitting the rightmost bolt thrower and the Scourge fails a charge on the blue spears who flee. In the center combat, he manages to hold on for another round with another skewed round. In my Turn 5 I finally manage to finish off the plague beasts and I reposition my infantry around the objective. He finishes off my firebase and charges into my blue spears with his crushers. I hold. In my turn 6 I countercharge his crushers with the Wardens and reposition. My spears and Wardens smash the crushers. Surrounded, my fliers and spear blocks were forced into some risky criss-crossing flee maneuvers on the last turn. 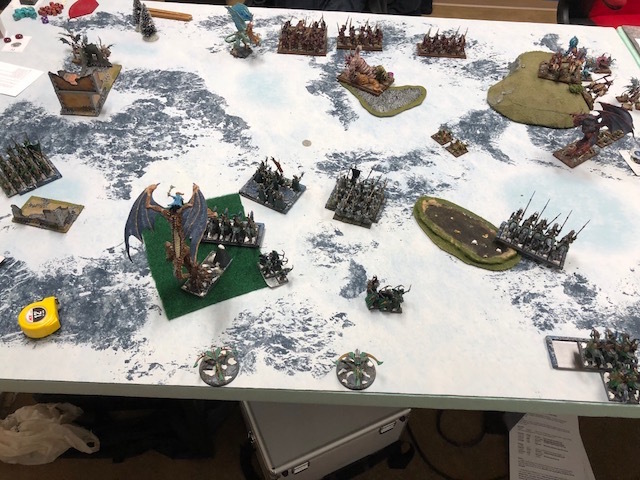 Fortunately, the slaughterers failed a critical redirect test preserving half my griff prince’s points(and general bonus), but I lost the dragon mage. I have to apologize to Micah because I became a bit salty in this game, turns 2-4 saw some of the most lopsided dice I’ve ever seen and despite what I thought was a well-played game, that on average should have probably been a 14/18 to me (depends on whether I get the Scourge fully down or if he survives and hides) it turned into a 3-17 to Micah. Micah was a gent the whole time and didn’t deserve my saltiness, I seem to have a Game 3 curse as I’ve gone down big-medium losses in Game 3 of the last 3 single GTs I’ve played.